HAMBURG, GERMANY: If you did a little bit of reading on the destruction of this town during WWII, you will be surprised to see how quickly this town achieved its ultra-modern look of present-time. This town was heavily bombarded under operation “Gomorrha” and was destroyed to the ground over the course of 3 nights and days in July 1943. Allied air planes attack killed more than 35,000 people and made 900,000 people homeless by destroying over 250,000 houses. The town was left with miles after miles of broken bricks and skeletons of buildings. Despite its recent horrified history, the city didn’t take much time to stand on its feet and be one of very well reputed German cities. 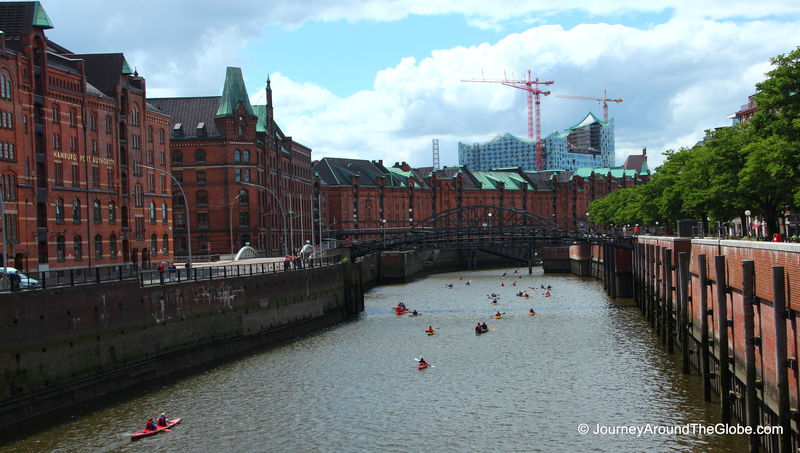 This is the 2nd largest city of Germany, Hamburg has country’s biggest port and the second busiest in Europe. Interestingly, the beef patties on a bun originally were invented here, but unfortunately, you won’t find any traditional hamburger in Hamburg. Hamburg has been an independent city of Germany for few centuries, which means Hamburg has its own Parliament and senate. The Parliament is headed by its own President and the Senate is headed by the Mayor of the city. TIME OF TRAVELING: Hamburg was our first destination when we were on our road trip to Legoland in Billund, Denmark in the 3rd week of July, 2012. It was about little more than 5 hours drive from our home in Tervuren, Belgium. Although, it was almost end of July, it felt chilly like March or April. We were well prepared, but I was really wishing for some nice hot summer days. OUR HOTEL: We stayed in Marriott Hamburg here. I loved the location of this hotel. Not only it’s about 10 minutes walk from the Rathaus (Town Hall) and city center, but also it is a premier location to do some high-end shopping. The hotel doesn’t have any free breakfast and free Wi-Fi but did have a parking garage (additional charge), which many European hotels don’t have. WHAT TO EAT & BUY IN HAMBURG:Our first dinner in Hamburg was at an Italian chain restaurant, Vapiano (it was late and that was the only option we had). They have stores all over the world, like New York. It’s a decent place with great food and very reasonable price. We really didn’t have any typical German food here. We mostly ate whatever we had in front when we were hungry. 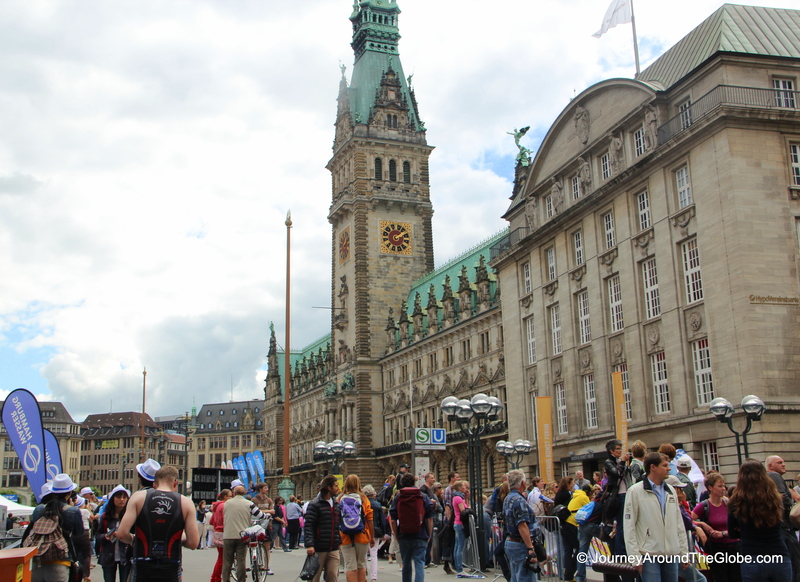 1) RATHAUS (TOWN HALL) & RATHAUSMARKT: Rathausmarkt is a big, I mean huge square in the heart of Hamburg by a canal. The square has old and new buildings lined up in one side and Rathaus on another side. The building behind the city hall is Hamburg’s House of Commerce (Börse), which was also severely damaged in WWII. You can easily identify the town hall in Rathausmarkt with its 112 meter tall turquoise green tower and sandstone building in Northern Renaissance style. Luckily, the building escaped bombardments of WWII. 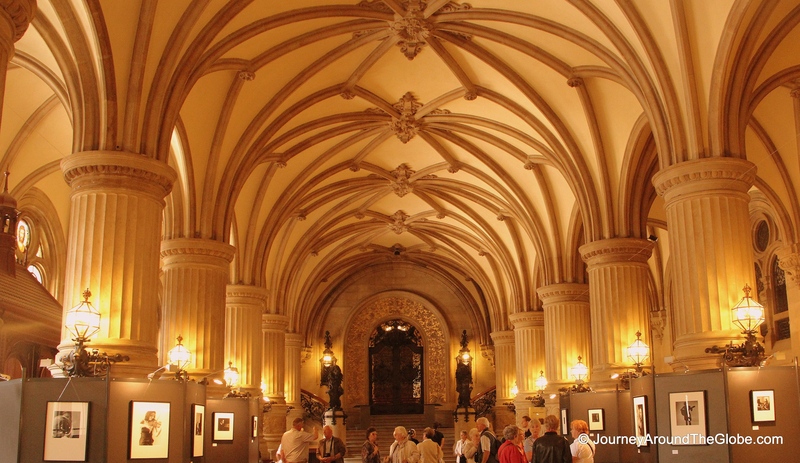 It is free to go to the main lobby of Rathaus, which is decorated with pretty lamps, decorative doors, and tall columns. There were some temporary exhibitions going on when we went. 2nd floor of the town hall can only be accessed by a guided tour. The tour gives you a chance to see the luxuriously decorated representative halls and chambers on the upper level. You get to visit the Parliament, Senate, Civil Chamber, Great hall, and few other rooms gorgeously emblazed with giant fire-place, exquisite leather wall-paper, more than 100 years old expensive furniture, paintings, and chandeliers. All these adornments were used to show off the wealth and power of Hamburg. It felt more like being in a palace than a town hall. 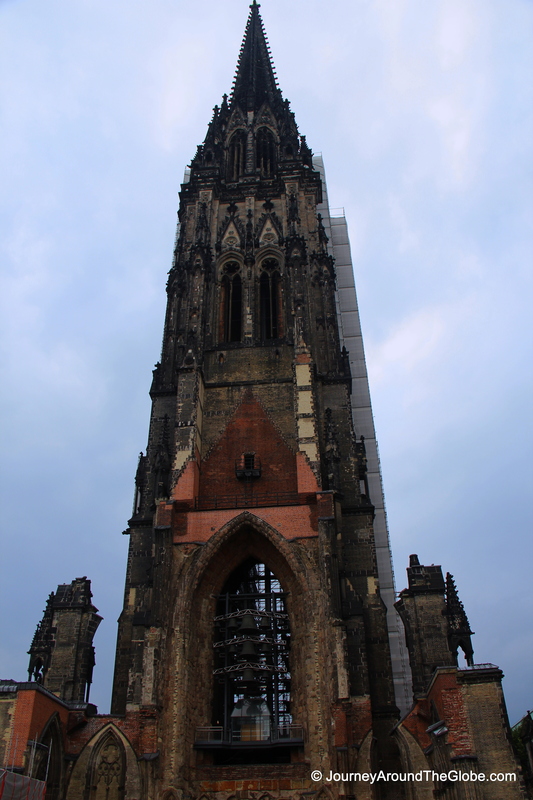 2) CHURCHES: There are 5 major churches in Hamburg that were totally damaged in WWII during air-raids. All of them were rebuilt on their original foundations except St. Nikolai Church, which only has remaining from the bombings. a) ST. NIKOLAI: Founded in 1195, St. Nicholas Church is one of the oldest churches in Hamburg. Over the centuries, it develops from a little chapel to a huge hall church. Which once used to be a church before the air-raids of 1943, St. Nikolai, is now a memorial against war and dedicated to all the victims of war and persecution from 1933 – 1945. The steeple, some rubbles, and part of the walls in front of it give a tiny bit of visual feeling of what the city went thru during WWII. The steeple of this neo-Gothic church St. Nikolai is 483 feet (147.3 meters) tall and was the highest in the world when built in 1874. Since 2005, it can be accessed by a lift to get one of the best striking views over contemporary Hamburg from 76 meters height platform. 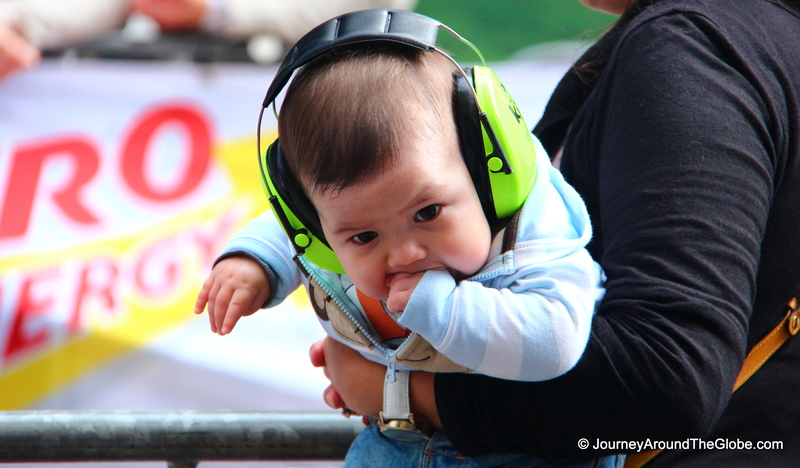 Ticket is 3.70 euros per person and 2 euros for children from 6-16 years. The service is open from May – September: 10 – 8 and from October – April: 10 – 5. The same ticket can be used for Documentation Center too. This is a museum under the glass dome, which was the crypt, in between the church spire and the other side of the ruins. The permanent exhibition features the history of St. Nicholas as well as history of the air war and its consequences exemplified by the city of Hamburg, Warsaw, and Coventry. 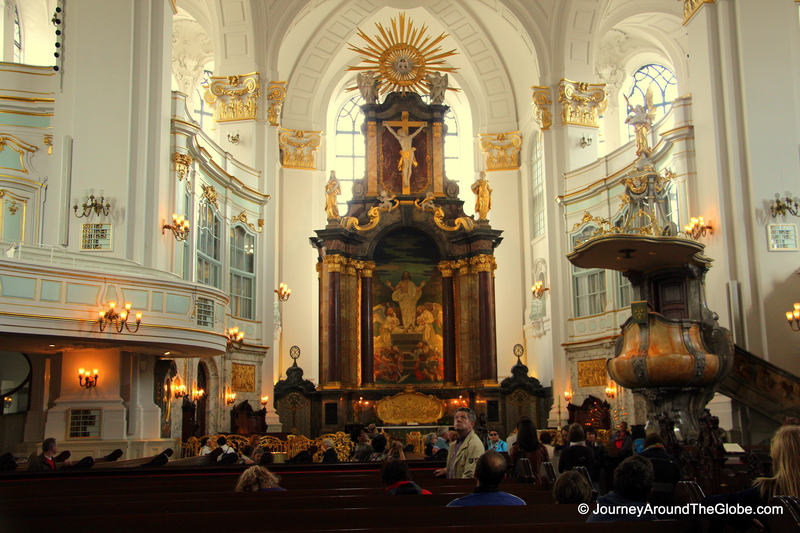 b) ST. MICHEL’S CHURCH: This is city’s landmark and the most beautiful and most crowded church we’ve seen in Hamburg. Interior of it is very elegantly decorated with white and golden walls, pillars, and ceiling. The altar has a huge painting with few maroon marble columns with Jesus on cross on the top. Don’t forget to check out the beautiful organ in the back too. 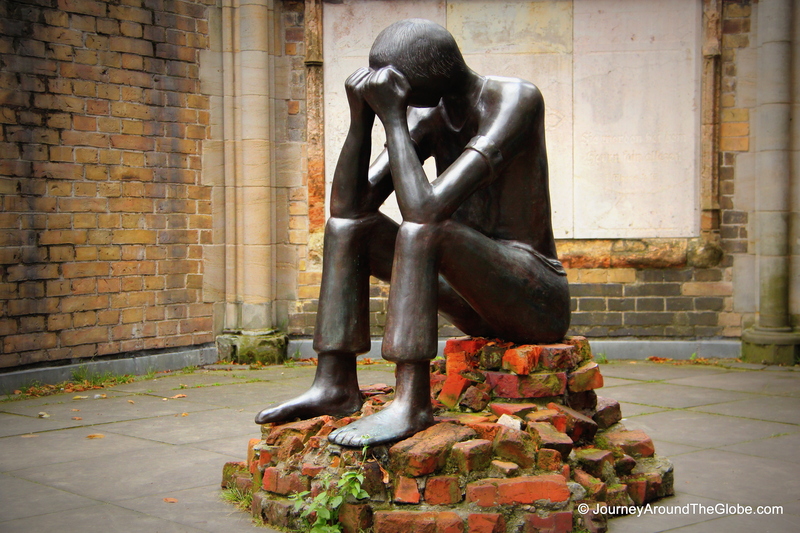 This is a must-see even if you don’t visit any other churches in Hamburg. You can go on top of St. Michel’s Church by paying 4 euros per person to get a panoramic view of the city. We didn’t go on top since we already went on the steeple of St. Nikolai Church. c) ST. PETER’S CHURCH (HAUPTKIRCHE ST. PETRI): This is the city’s oldest parish church, with records going back to 1195. The church is very simple inside. But the old paintings from 15th/16th century are something to appreciate, as well as the giant church organ in the back. Visitors weren’t allowed to take pictures inside. d) ST. JACOBI CHURCH (HAUPTKIRCHE ST. JACOBI): Construction of this church started from 1340. Three altars of this church date back to 1500, the pulpit is from 1609, and the organ is from 1693. The church was destroyed in WWII and was rebuilt from 1951 – 1963. This is not as dull as St. Peter’s Church. The altar is simple but the organ is very impressive and big. e) ST. KATHARINA CHURCH: This is one of the five main churches of Hamburg. Unfortunately, we couldn’t go inside the church because there was some work going on inside it. 3) SIEVENKING PLATZ: This is a pretty square/park for the locals to chill and the tourists to explore different corners. 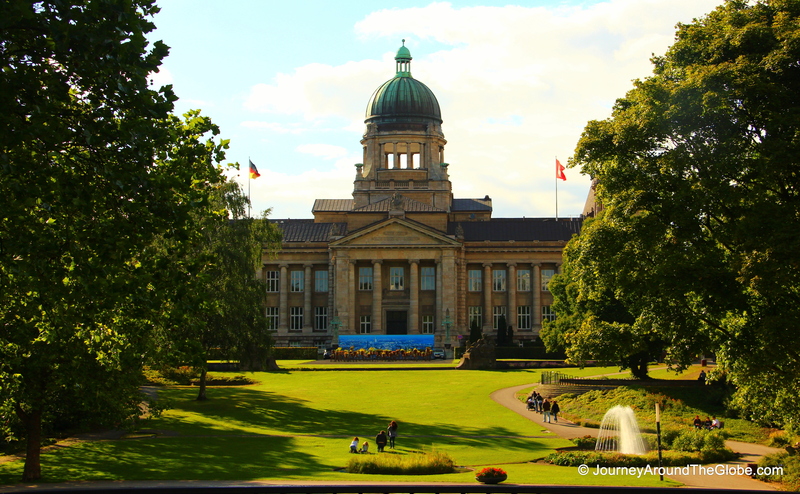 The square houses some important judiciary buildings, such as Constitutional Court, Civil Court, and Criminal Court. We couldn’t go inside any of these buildings (closed on Saturdays), but it is nice to walk past these nice architecture even from outside. a) TROSTBRUCKE: We passed this bridge on our way to St. Nikolai. This is for both vehicles and pedestrians. The 2 statues on both sides of this bridge are of Graf Adolf III (holding a sword) and Bishop Ansgar (holding a church). 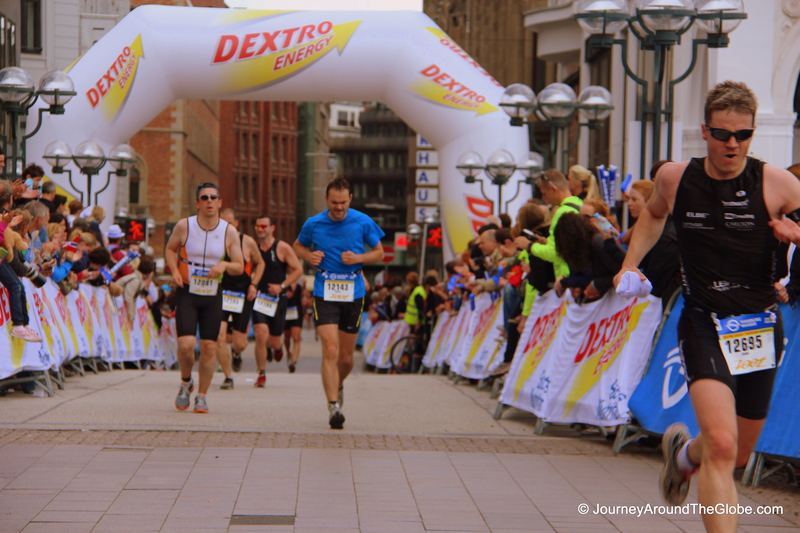 b) KORNHAUSBRUCKE & ZOLL CANAL: The bridge is only few minutes walk from St. Katharina Church. This is also for both vehicles and pedestrians. This bridge gives a wonderful view of the surroundings and Zoll Canal. 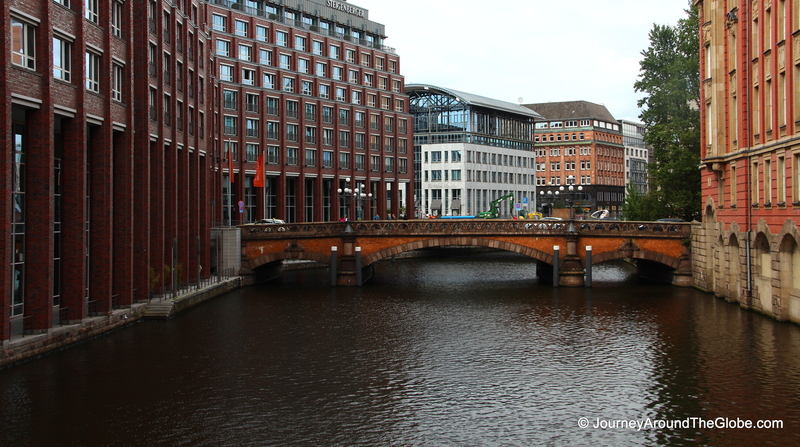 On the south side of the bridge is Speicherstadt, where you will see old red buildings lined up the water side, one of them is “Hamburg Port Authority” building. At one end of the bridge, there are statues of 2 famous explorers, Columbus and Vasco da Gama. 5) ALSTER BOAT TOUR: Taking a boat tour on Alster, also known as “Pearl of the City”, is almost a must-do here. 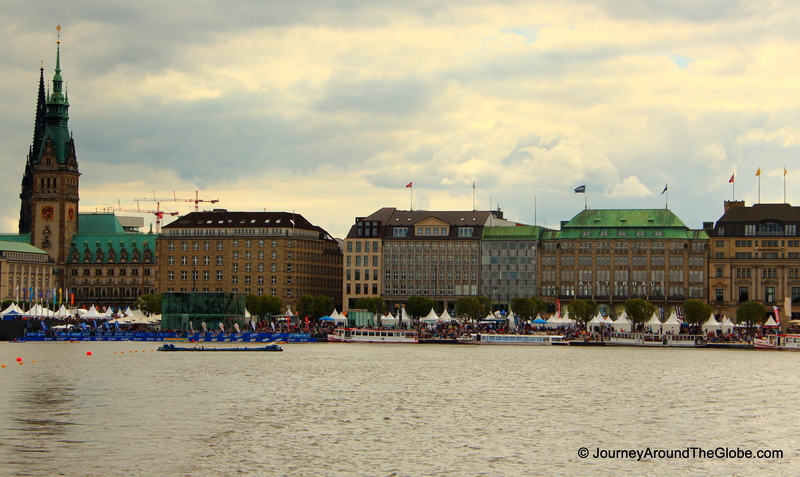 It gives a view of Hamburg from the water or from the white Alster steamers to the city’s beauty. From here, city’s different faces can be truly appreciated. 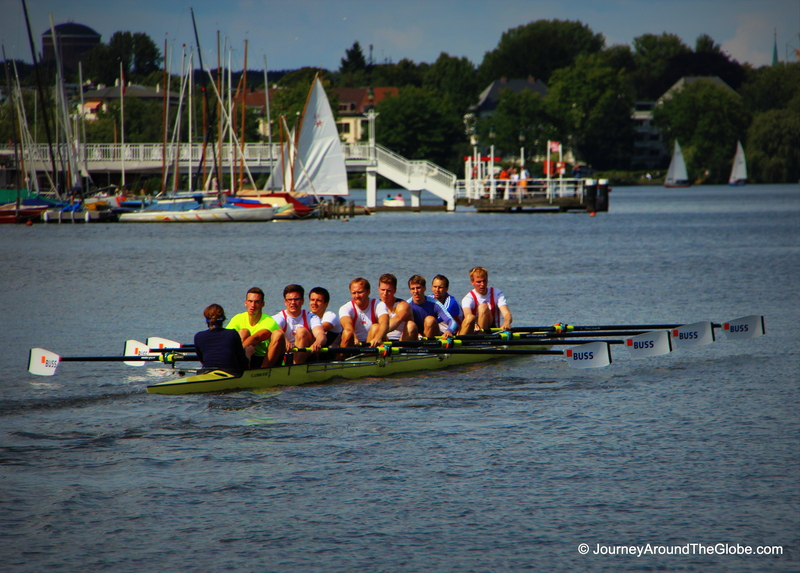 The boat takes you to the Binnenalster (Inner Alster), passing 2 bridges – Lombards Bridge and Kennedy Bridge. Then to Aussen Alster (Outer Alster) with view of soaring towers of all 5 main churches along with the tower of Hamburg Town Hall. In Aussen Alster, residential areas for wealthy Hamburgers and the city’s grandest villas can be seen. 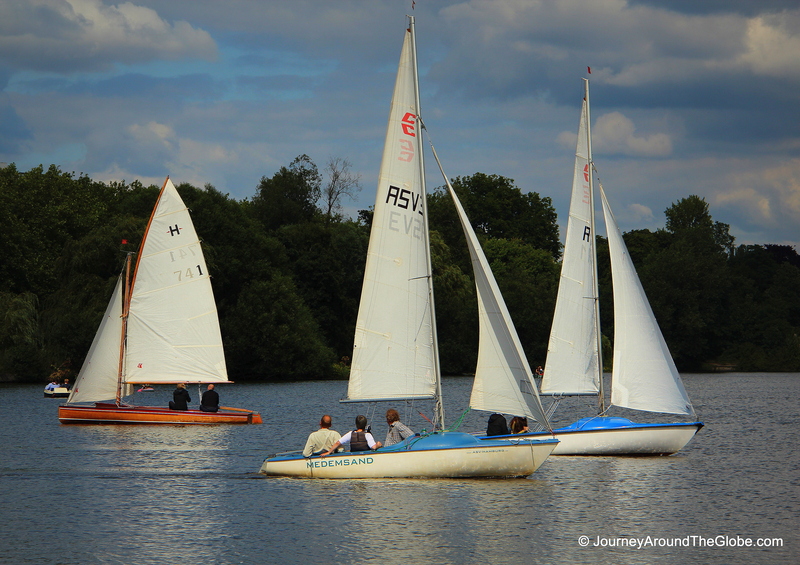 It is also a popular water sports location among sailors, rowers, and canoeists. 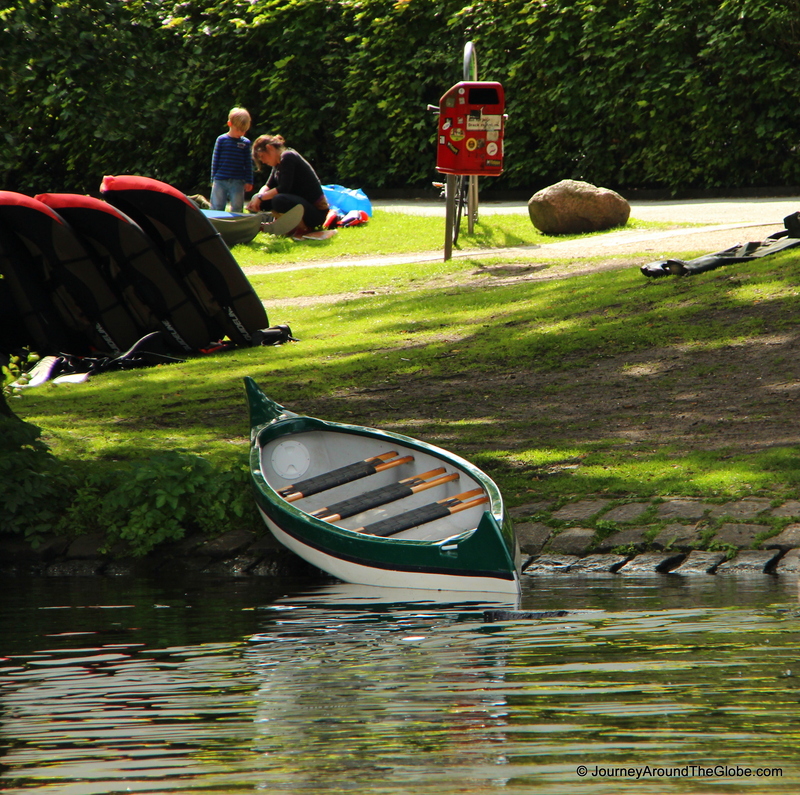 The boats can be accessed from Jungfernstieg – Alster boat tour deck, which is about 5 minutes walk from Town Hall. The tickets can be bought right there on boats. There are couple options when choosing the tour; you can take either 1 hour tour or 2 hours tour. We took 1 hour boat ride and it was 13.50 euros per person, kids under 6 years of age are free. 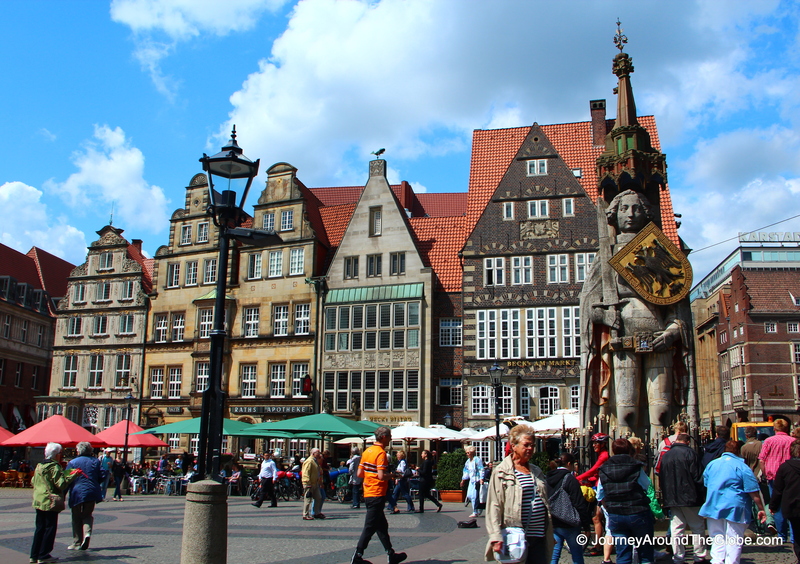 6) TRIP TO BREMEN, GERMANY: You can’t leave Hamburg without making a day trip to Bremen. It’s less than an hour drive by car. Bremen’s city hall and its surrounding is on the list of UNESCO World Heritage site. The twisted, narrow alleys of the old town are magical and fun to get lost in, where you also get to see “probably” the smallest hotel in the world.